Well friends, we are very proud to announce the launch of our Halloween inspired promotion called Trick Or Treat! 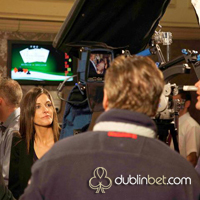 All the fun and games for this promotion is already happening over at our microsite www.dublinbet.com. Those of you that have been with us for a while will remember this microsite with its generous gifts from 2011 and 2012, we just love bringing it back! Here is a bit more about it for you newbies! What is Trick or Treat? Trick or Treat is a promotion offering unique deposit bonuses for a 48 hour period over Halloween, starting at 00:01 GMT on the 30th of October and it runs through to 23:59 on the 31st. You have the option to choose between a cozy €150 TREAT or taking a risk by opting for a TRICK, where you could be awarded a bonus with a value between €10 and a whopping €500! Not bad for a spooky prize. So which would you choose? 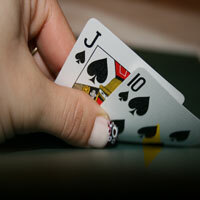 Play it safe and win a guaranteed amount or risk it for the big win? Choose wisely, as you will only have one chance to play! 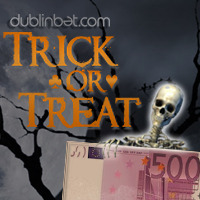 Both choises are displayed on the home page of www.dublinbet.com but the Trick and Treat buttons will only be active when the counter reaches Zero at 00:01 GMT on the 30th of October. Will you stay up for it? I will, but mainly because i want to check that it works for you! But we wanted to make the Halloween fun start earlier and make it last a bit more, as 2 days just doesn’t seem to cut it, so what we did is we added a prize draw game to dublinbet. Yeah! 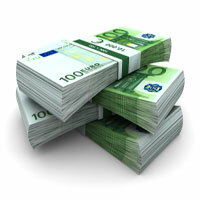 So now we are also offering you the chance to win up to €500 in Cash in the dublinbet free Prize Draw. And this is already up and running and you can participate any time. With a Grand Prize of €500 and a total prize pot of €1,000 it’s definitely worth entering and come the start of November you may find yourself up in the pocket by €500, not bad! 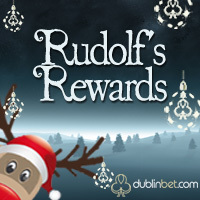 Seriously though, it must be one of the easiest prize draws to enter, all you have to do is insert your email address on www.dublinbet.com/. We’ve also added ways for you to increase your chances of winning, either by playing on dublinbet or by going social on Facebook and Twitter. We’ve collected and are now ‘exhibiting’ a collection of Halloween pics and facts for you to have a browse and perhaps participate in our ‘Monster Captio’n game, it’s for a good cause.. the potential to win €500 in cash! Join in the fun! 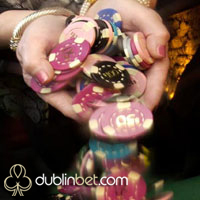 So to enter and find out ways to increase your chances of winning, just scream along over to www.dublinbet.com – get it? Will you escape from the chilling Mysterious Mansion – Rumour has it our slot machine is haunted. Ghosts and ghouls protect the prizes, will you be the one to match the symbols and win a spook-tacular treat? This 5-Reel 15-Line slot will have you shaking with fear and excitement. Match 3 or more bonus coffins to trigger the bonus game but beware of Uncle Bruno. If he appears there is no prize. Only the bravest survive in Mysterious Mansion! We do love Halloween at dublinbet, such good fun! Celebrity Poker? Bet you can’t guess who’d Scoop the Pot!